* RPM parameters reflect Fritz Aquatics’ QC pass ranges, the median is targeted. Be aware source water can greatly affect parameters especially alkalinity. QC is conducted using RO/DI at a neutral pH and a TDS of 0. 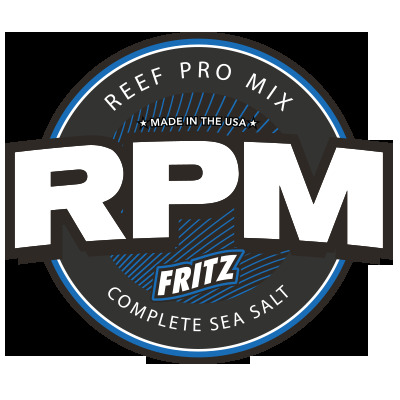 For best results it is important to follow proper mixing instructions when using salt with elevated parameters like Fritz Aquatics Reef Pro Mix. See below for best practices when using RPM. When Mixing Fritz Reef Pro Mix , it is best to use RO/DI water quality checked by a TDS meter (TDS should be less than 10ppm, 0 is preferred). Fill a clean mixing container (dedicated to saltwater mixing only) with desired amount of water to be prepared. For best results use water between 70° – 75°F (21° – 24°C) when mixing RPM. Slowly add desired amount of RPM to the water to avoid an increase in temperature and precipitation. This helps to prevent precipitation of calcium, alkalinity and other elements. It is recommended to use a mixing pump and an airstone when mixing RPM. This will also help to avoid concentrated areas of material and precipitation. Using a properly calibrated refractometer, bring the water to the desired salinity. Once mixed to a clear solution, add a heater to the water to bring to the current temperature of your aquarium. It is recommended to allow two hours before performing a water change. If water does not mix clear, please contact us for further mixing tips before performing a water change. DO NOT MIX DRY SALT DIRECTLY INTO SYSTEMS WITH LIVESTOCK PRESENT! CAUTION: Keep out of reach of children. Not for human consumption. Generates slight heat when added to water; avoid handling with wet hands. Contact with dry powder may cause skin and/or eye irritation. In case of contact, flush eyes with cool water and seek immediate medical attention. Storage: Store in a cool, dry place. Keep product tightly sealed.